Bristol Valley Hardwoods offers DeckoratorsTM deck railings balusters and accessories to complete your desired deck look. These ballusters complement our Ipe Decking – the superior choice for wood decking. We offer a variety of Deckorators baluster styles as well as decorative features, railing connectors and installation guides. Fortress iron ornamental railings and fence systems combine strength, beauty and durability. Fortress iron railings are made with a dual galvanizing system and premium exterior powder coat finish to eliminate virtually all maintenance concerns. You choose the look. From old world charm to sleek modern lines, Fortress offers stunning design. Bring quality and beauty to any patio, deck or balcony. The Classic Railing provides the unique opportunity for an attractive railing with increased visibility. It provides a clean, classic appearance that is versatile for a variety of applications and surfaces. 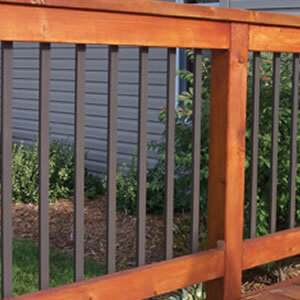 Great for Deck Railings, Indoor Railings, and more! Stainless steel cable railing systems is a beautiful alternative to wooden rail systems allowing for a clean, un-obstructive view. Installation is simple and fast! Cable runs are packaged to include the necessary hardware for each – a fastener on each end. It’s that simple! You aren’t locked into standard lengths. And we can provide a custom design with a quick turn-around for your convenience. We will assist you in selecting all of the parts and pieces you need for this easy to install system. 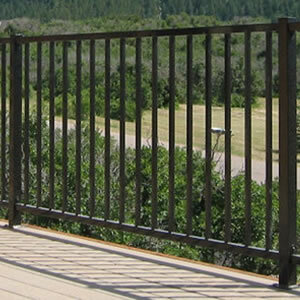 Cable railing system will provide you with a safe, strong, low-maintenance guardrail for your deck, balcony, porch, stairs or cable fence that you can look right through. 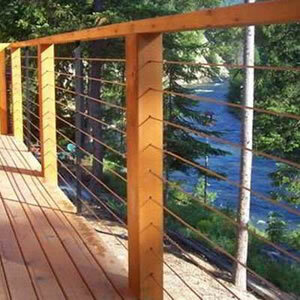 Low-maintenance cable railing lends an upscale look to wood, metal or composite posts. Ideal for residential as well as light commercial projects.